"I get to work with amazing people"
"The variety and experiences that Army ministry offers are incredible." Could you support troops whenever they need you? Provide comfort and advice wherever you are in the world? That’s the job of our Chaplains – Professionally Qualified Officers who have been ordained in one of the recognised Sending Churches and have been selected to hold a commission in the Army. 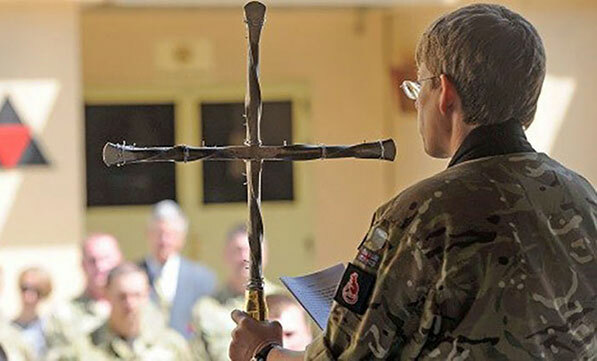 Chaplains wear British Army uniforms and provide leadership but do not command and do not carry weapons. Chaplains are assigned to a unit with which they live and work, offering spiritual support, pastoral care and moral guidance. Where the unit goes, so does the Chaplain. Give spiritual support, both publicly and privately, at every level of the Army. Provide pastoral care at home and abroad. Offer moral guidance through formal teaching, counsel, and personal example. Travel wherever your unit goes. You do your initial training at the Armed Forces’ Chaplaincy Centre in Hampshire. You will join the Army as a Captain, on a minimum salary of £40,025 a year. As a Chaplain you learn the military skills you need to perform your clerical duties in an operational environment – things like field craft, map reading, communication skills, leadership studies, first aid and physical fitness.